My girl friend Robin Raskin wrote a brilliant piece for Huffington Post on what it’s like to be old in a young person’s business..I wanted you to read it because some of you are starting to take part-time jobs in environments that are mostly populated by people that are in their 20s, 30s and 40’s. Life can be fun at your new job, but beware, office life is very different from the days when we were the stars. Here are a few tips that will keep you happy and satisfied. It works. Listen to Robin. I’ve thought about writing this piece for the last two decades which means I am not getting younger. But now that no amount of hair dye, gym time, or makeup does the trick, it’s time for me (and many of you) to fess up. For those of you who were pioneers in the world of technology, congratulations, you are now old people in a young person’s business. Can you survive in a world where a cloud is no longer a cumulus in the sky and an incubator isn’t just for chickens and babies? Understanding age and ageism in a young person’s world is going to take some effort, some humility, and some crafty thinking. Here’s my to do list for growing old after forty years in the tech business. 1. Try new tech, even if you screw it up: When I began writing about tech, you could screw up in the comfort of your home; no one was the wiser. Today, social networking (a likely place to screw up) makes your errors totally transparent. Get over it. If you haven’t used Instagram or SnapChat, you need to try it. If you haven’t tried to navigate VR, you must. And you must summon the same child-like sense of wonder you did when you first typed Ctrl+Alt+Del. My thirty-something kids call me out when I mix up my messaging systems, my photos show up upside down, or my voice to speech texts are laden with the word PERIOD spelled out. I accidentally stick lines of thumbs up emoji into every chat, and my touch typing is a lot faster than my texting. But I do it and am deprecating about my often very public screw ups. 2. Humor ‘em: They take life very seriously, as you did when you needed to prove yourself to the world. Remind them that to screw up is human (and probably machine-like, too). 3. Laugh about the culture divide: I love my young assistant to death, but when I give her a list of “to dos” and she tackles them in the order she sees fit, I’m apoplectic. “When I give you a to do list, it is not a pick list,” I tell her. We laugh and move on. We also have honest discourses about everything from corporate dress to politics. I love every minute of it. 4. Dole out a complement: Would it kill you to say something like “that’s such a novel idea” or “I love your thinking” to a twentysomething? At least complement them on their rapid fire texting or their ability to divvy a Venmo tab. You may be wiser, but chances are they’ve got more mobile dexterity. 5. Don’t bring up the good ole days more than once a week: Seriously, they weren’t so great (okay, the pay and benefits were better). But files got lost on hard disk drives, user interfaces were inscrutable. In contrast, new technology is more inclusive for many more people. If you survived the early days of technology, you’ve earned your badge to tell your story. Just not too often. 6. Don’t be afraid to ask: What is an ICO? Or what’s the difference between an incubator and an accelerator? I’m not familiar with that acronym. Asking questions is not a sign of idiocy; it’s a sign of interest. Asking for help is a skill that takes a while to develop in young employees, and you need a refresher course as you get older. 7. You are what you wear: I’m not saying you need to be a walking advertisement for the connected lifestyle, but you won’t be taken seriously if you don’t cart around the tools of your trade. Think of it like your business card, only more expensive. Super lightweight notebook, late model cell phone, appropriate looking laptop bag, etc. Start weaning yourself from quaint practices like paper business cards. 8. Collaborate: No one in the tech business toils in an ivory tower anymore. There are so many group project trackers, calendar add-ons, voting systems, video conference tools, shared documents and collaborative tools that you’ll probably want to enter a nunnery, but get proficient. Dropbox, GoogleDrive, Trello, MS One Drive, Zoom… just to name a few. If you’re going to do business in the tech world, you’re going to have to be fluent in collaborating with them on the platform of their choice. 9. Cultivate your persona: You have earned the right not to wear khakis and black t-shirts. You cultivated a look from a different era. To my older friends: Think Iris Apfel or Donna Karen —two icons who’ve kept their status in a young person’s industry. Guys, I’m afraid you’ll still be stuck with the khakis, but lose the suit (unless you’re Vint Cerf or Graydon Carter). 10. Add to your diversity checklist: The world has changed since I was the only woman in the tech room, and there’s room for lots more. Seek out diversity and you’ll expand the rather limiting world you knew in the early days of tech. 11. Never be complacent: Survivor badges are a reality show myth. You need to earn the respect of your industry every day. Riding on your laurels? It’s not part of the the new DNA. You can also click here to read Robin’s Huffington Post article. 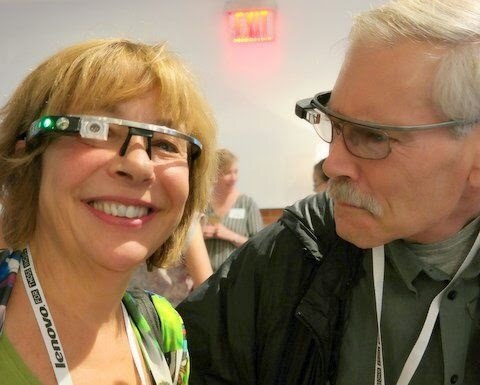 Robin Raskin, tech entrepreneur, is wearing her creation, Faux Glass, and Fred Fishkin, a tech journalist, is sporting Google Glass. Leave it to Robin Raskin, a long time journalist turned entrepreneur, to create the most hysterical tech/fashion statement of all time. I couldn’t believe my eyes when I saw her Crowdfunding campaign on Indiegogo for Faux Glass. What a hoot. I’ve known Robin for decades. She never ceases to amaze. Although she is only seven years younger than me, I feel like her mother. Her boundless energy and never ending creativity is that of a 21 year old. I am constantly in awe. 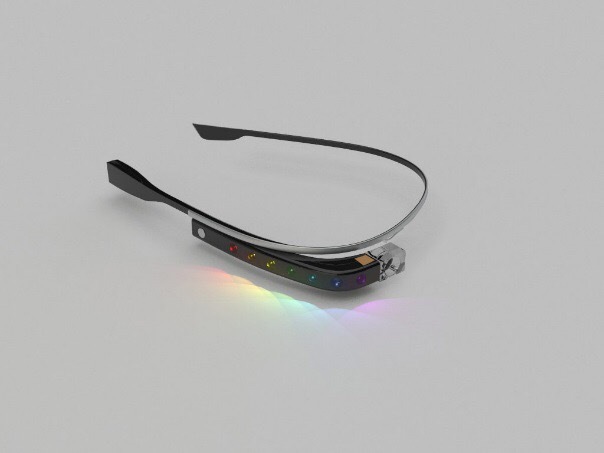 Faux Glass has been designed to look like Google Glass but in reality is a $20 pair of glasses with some LED lights. Robin is raising money on Indiegogo to bring Faux Glass to market so the masses can have the opportunity to look cool. Why should the folks who can afford the augmented reality glasses at $1,500 be the only ones to look special? Faux Glass will also be available for sale on the Faux Glass website in December. Check Robin out. She is an editor, author and tech expert. She founded, Living in Digital Times, (LIDT), a team of technophiles, who bring together top experts and the latest innovations that intersect lifestyle and technology. LIDT produces conferences and expos at CES as well as other times throughout the year. I’m also going to do another piece about Judy because she is an engineer who designs digital jewelry. As you know, there is a whole new industry called wearables. That means you wear technology in the form of a necklace, wristwatch, ring, pin, and other yet-to-be named accessories. Both Robin and Judy were in Miami for a Boston Consulting gig and heard about the Tech Cocktail meetup in a local warehouse, so we went along with them. 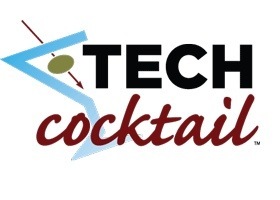 Tech Cocktail parties pop-up all over the country and their purpose is to promote local start-ups. 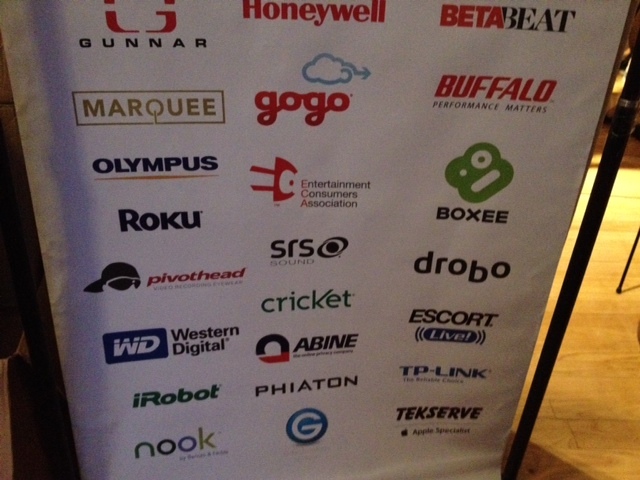 We met some creative people at a few innovative companies that we will write about in the coming weeks. Here are some photos from last night. It was pretty dark in there. 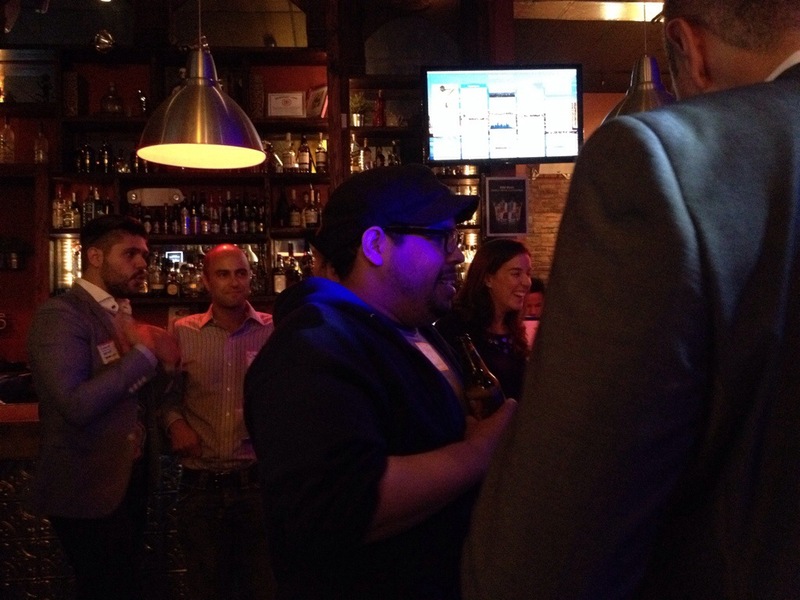 The world of tech likes to party. Every month, or sometimes every week, there is some event that industry people can attend to see new products, socialize, drink, eat, and go home with a bag of goodies. 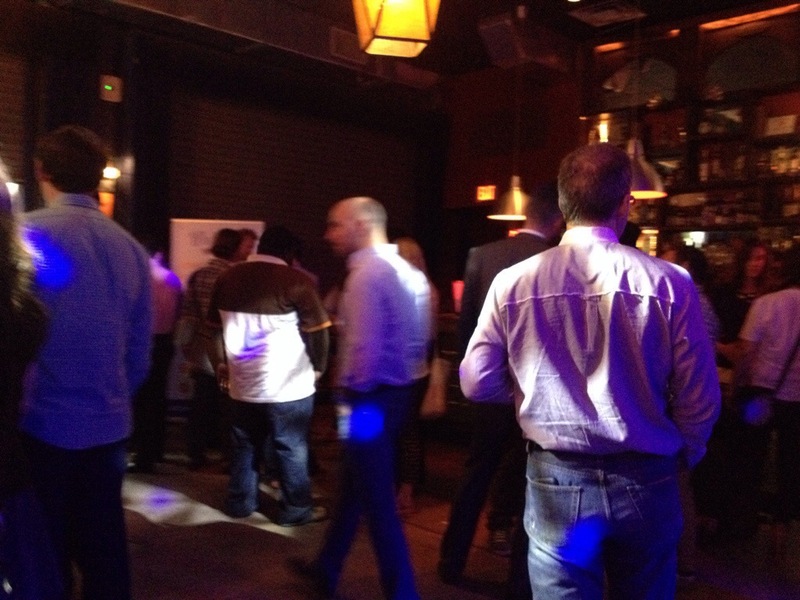 The gdgt event last night, smack in the middle of Silicon Alley in New York City, was a little different. This one was targeted to the consumer. 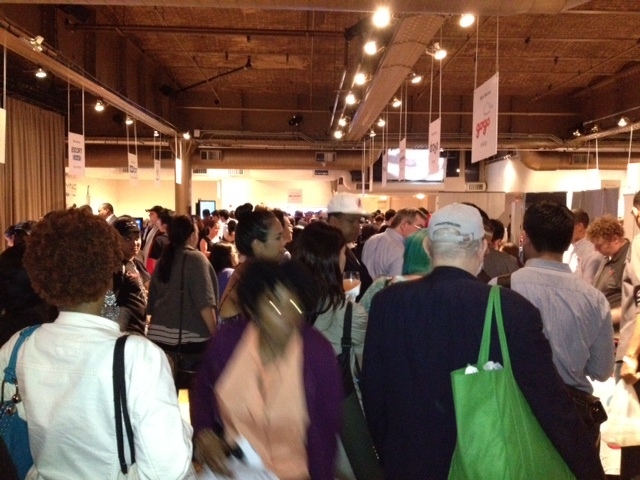 Thousands of people showed up to walk through the exhibit hall at The Altman Building, 135 West 18th Street. Manufacturers and app developers had their new introductions on display to get first hand customer reactions and to start generating sales. FYI, gdgt, a company that dropped its vowels, is a blog where you can get reviews from people who actually have the product you’re looking for. 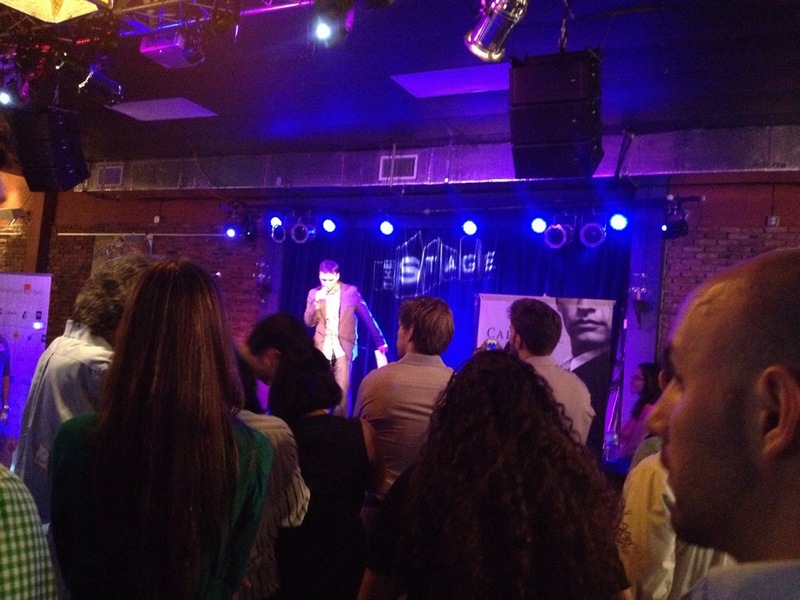 They run live events all around the country as a means to get the innovative companies to interact with the public. 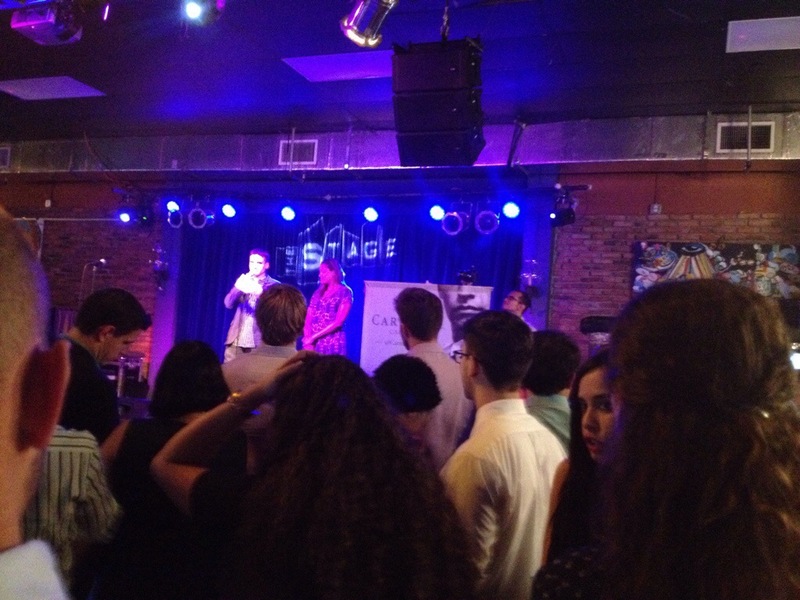 Last night was my first time attending as a blogger. I am usually a PR person pitching product myself. I wanted to find new, exciting products to tell you about. One of the most interesting pieces of information that I picked up is that AARP is becoming a sponsor of some of these events. Robin Raskin of Living In Digital Times told me that AARP is expressing more interest in technology. It all makes sense to me but I will let you know about any services they develop involving innovation. 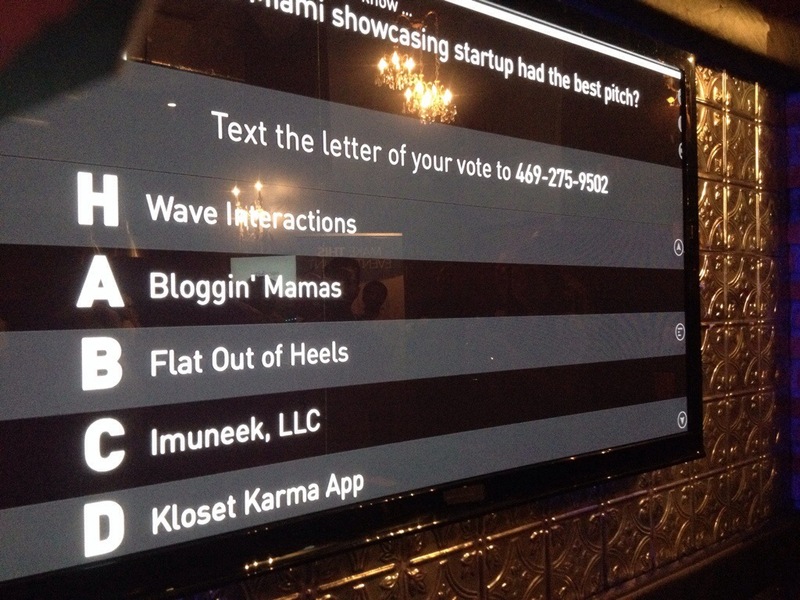 Here are some of the innovations I saw last night that might interest you.